AraAppaloosa horses are a refined version of Appaloosa in many ways. The main registry for the Appaloosa horses was established in an effort to protect and develop the Appaloosa. Because of claims of similar ancient origins, the registry allowed the Appaloosa to be crossed with pureblooded Arabians. The AraAppaloosa of today is said to be a re-establishment or preservation of the best examples of the Appaloosa breed found, namely, in early American Indian tribes. AraAppaloosa horses are known primarily by their coat; which needs to be one of the basic Appaloosa color patterns. They are between 14 and 15 hands high and have the same general conformation of the Arab: refined head, stamina, and elegance. The AraAppaloosa and Foundation Breeder's International is, in some ways, an off-shoot of the Appaloosa Horse Club founded in 1938. The AAFBI was formed for those breeders interested in establishing the Appaloosa with Arabian blood. Both breeds show ancient ancestry in Asia Minor, leading the AAFBI to believe that a crossing of the two would lead to the "true" Appaloosa horse (good examples of which were seen, and today modeled after by the AAFBI breeding program, in the Nez Perce Indian tribe's stock in the early 18th century). There are claims that the spotted horse is the oldest horse "type" found in the world, and it is the AraAppaloosa Registry's aim to develop a refined horse that lives up to this history. Like the Pintabian, the AraAppaloosa is any high-quality Appaloosa that is crossed with an Arabian. 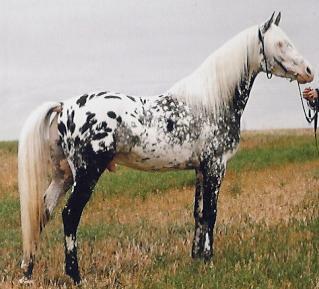 Breeders claim that the ancestry of both the spotted horse and the Arabian are similar and should thus be incorporated into a single, dignified breed.